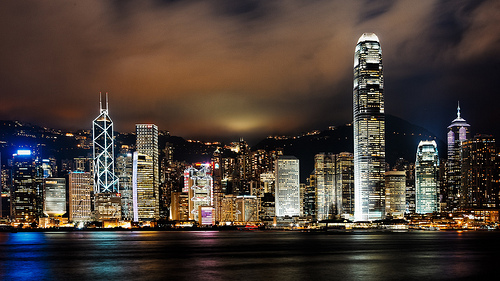 A good fare to visit Hong Kong. Valid for travel from late-August – December, 2014. Must purchase at least 4 days in advance of departure and by May 31st, 2014. MCO – ORD (Chicago) – HKG (Hong Kong) – PVG (Shanghai) – ORD – MCO. The segment between Shanghai and Hong Kong is operated by Dragonair or Cathay Pacific under Dragonair code. 17,020 miles or 5.3 cents per mile. The segment between Shanghai and Hong Kong will earn zero miles with American or Alaska. It does, however, earn 25% with Cathay Pacific Asiamiles or British Airways Avios. The United segments will earn 100% mileage with United. Book on Orbitz using dates found on ITA Software Matrix Airfare Search. Make sure “Additional search options” is selected then check “Narrow the search to my preferred airlines” and select “United Airlines” under “Airline 1″ and select “Dragonair” under “Airline 2″. 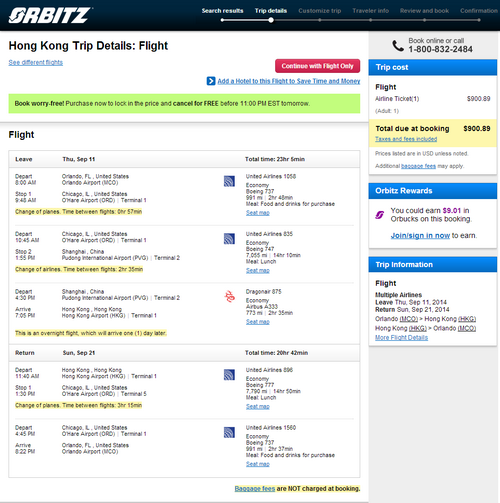 There is a price difference between what ITA results ($894 and what Orbitz results, $901. The difference is Orbitz charging $7 for multi-carrier itineraries).